A hole in one? A drop in the swamp? The golf ball awaits its fate. Capturing a golfer in mid-backswing when their club is at the highest point of its arc, this quirky little sculpture represents the crucial moment when glory and misery hang in the balance. Once hit, the ball could land right in the hole—or sink to the bottom of the pond. 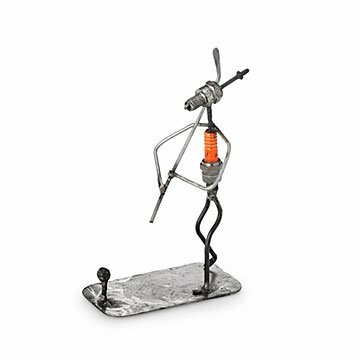 Artisans in Ouagadougou, Burkina Faso, give recycled spark plugs and scrap metal some glory of their own by saving them from a landfill and turning them into whimsical little figurines that make great golf-lover gifts. Since it is a Christmas gift, he hasn't received it yet. I know that he will love it though.